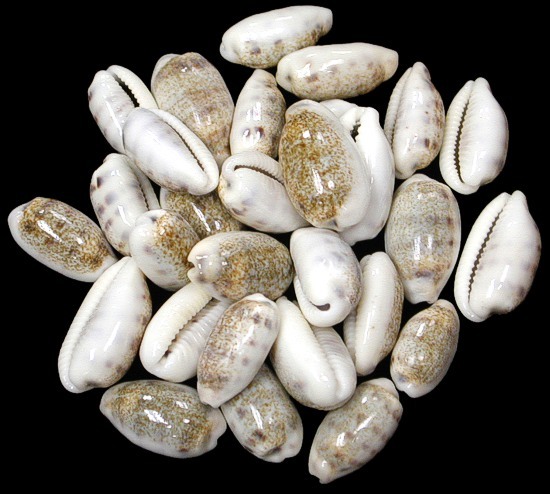 DescriptionCyprea shells or the more common name Cowry Shell are the most universally collected shells. They are prized for their colors, glossy surface and markings. There are approximately two hundred species. The most abundant are in the tropics. In its first stage of growth the cowry develops a short pointed spire (a spire is the coiled part of the shell and it usually tapers to a point). As the shell grows the spire and its developing edge thickens. In its last stage of growth the edge thickens and it forms teeth along each side of the aperture (aperture is the opening at the front end of the shell). The basic shape of the Cyprea shell varies little. However, they vary greatly in size, color, pattern and the arrangement of the teeth along the aperture. HABITAT.Cyprea or Cowry shells are active at night and hide during daylite. They feed on algae near coral reefs. Lyncina carneola, common name the Carnelian cowrie, is a species of sea snail, a cowry, a marine gastropod mollusk in the family Cypraeidae. 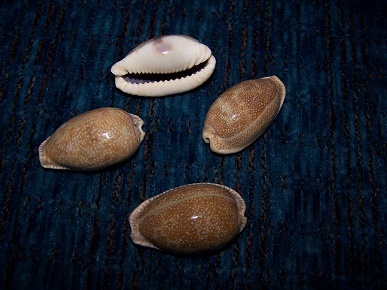 These shells range from (1–3 inches) in length. Their shape is rounded, basic color pale orange-brown, with some transverse bands. Some shells have very little orange hue. 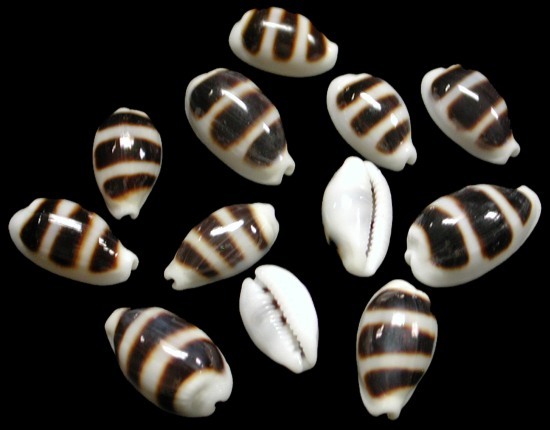 A few of the shells have color and markings similar to Cyprea Teres. This species are found in the seas off Aldabra, Chagos, the Comores, the East Coast of South Africa, Eritrea, Kenya, Madagascar, the Mascarene Basin, Mauritius, Mozambique, the Red Sea, Réunion, the Seychelles, Somalia and Tanzania. 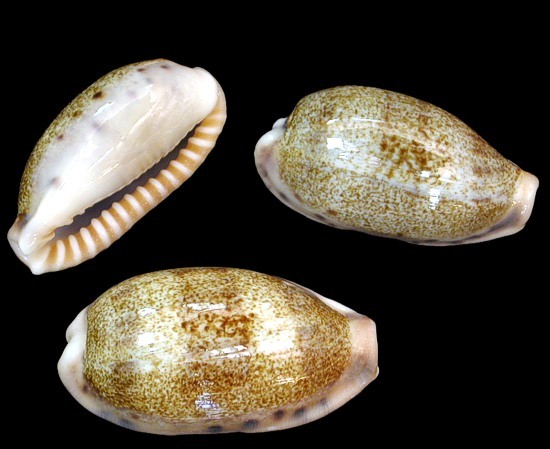 Like other Cowry species, the Cyprea Bistrinotata is active at night, prefers to live near coral reefs and is generally found across the Indo-Pacific region. 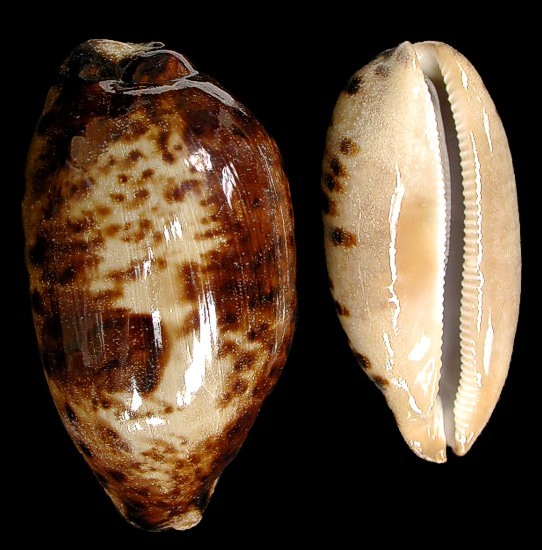 Description This a small solid elliptical shell with a covex base, often called the Honey Cowry. The teeth on each side well developed. There are darker brown colors between aperture teeth The color pattern is a lilac or pale blue. It has large brown spots intermixed with pale spots. The brilliant colors fade in time after capture. HabitatLives in tropical waters between the Indian Ocean eastward to the northern shores of Australia/New Zealand. Some have been found in the Southern Japanese waters. The Helvola Cyprea shell, like other Cowries are nocturnal, living near coral and rocky sea floors. CYPREA MAPPA SHELL PINK BASED is found in the Indo-Pacific region from the Indian Ocean East to the North Australian/New Zealand shores. They belong to the gastropod Cowry shell family. 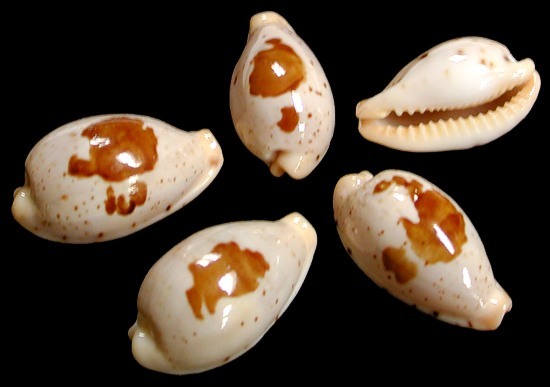 Cyprea shells have been popular among collectors and tourists for many years. They are popular due to the glossy outside shell, color and markings. 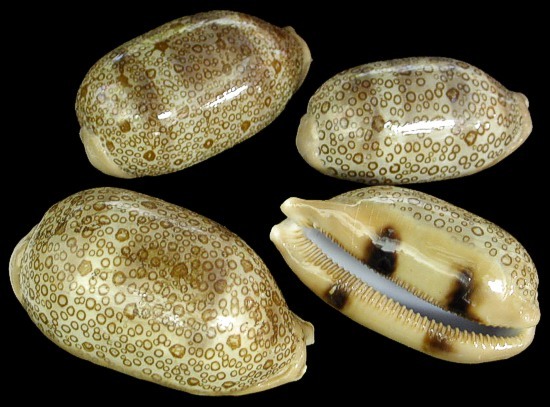 The basic shape of the Cowry shell varies little; but they differ in size, color and markings. Habitat. The Cyprea Nucleus shells are active at night. They hide behind rocks deep in coral reefs. They range from the Indian Ocean east to the northern Australian shores. Range Indian Ocean to Northern Australian shores. Nocturnal (active at night) and feeds on algae. Prefers to hide in coral or rock crevices during the day. 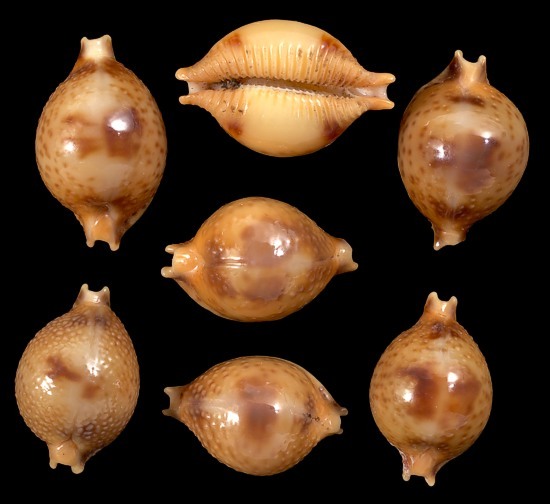 Cyprea Palidulla are gastropods belonging to the Cowry family of shells. Cyprea Poraria shell is in the family Cypraeidae. The Cowry family of shells is a small family of about 200 species. 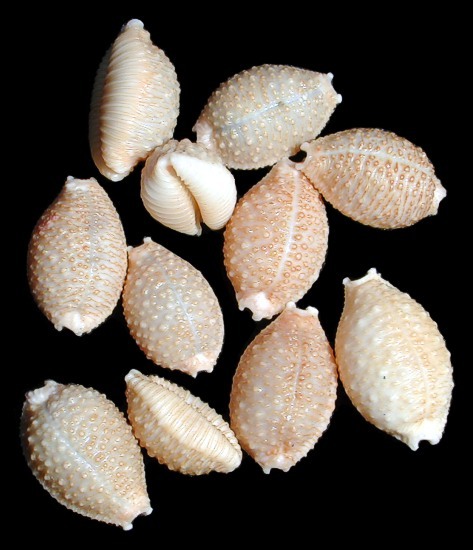 The Cypraeidae family is the most collected of all sea shells. They have a combination of form, texture and color which makes them so appealing to the collector. Most of the Cyprea species are found in tropical seas on or near reefs. Most live in the intertidal region hiding during the day and feeding at night. Cyprea, including the Bistrinotata species, feeds on algae, sponges, dead organic matter and other molluscs. The most distinguishing feature of the Cyprea (Cowry) is the ornamentation with various designs and coloration which camouflage the animal from predators. The Cowry retracts the mantle into the shell when disturbed. The mantle of the Cyprea Poraria is thick, muscular with unique coloration. The listing picture. 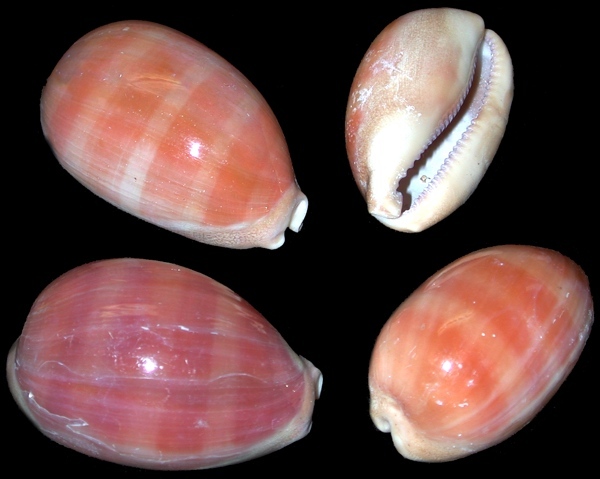 The picture captures the color and markings of the Poraria shell. The under side of the shell is flat and classic Cowry. Description. Cyprea Stolida is a gastropod. It belongs to the Cowry shell family. This species is rare. It was collected live near Santa Roita Island of the Philippines. They are popular among collectors for their color and outer shell design. Habitat. This particular species found near the Philippines. They range thoughout the Indo-Pacific region; from the Indian Ocean east to the Northern Australian/New Zealand shores. Like other Cowry shells they are nocturnal and feed on algae. The Cyprea Stolida prefers coral reefs or rock sea floors to hide during the day. 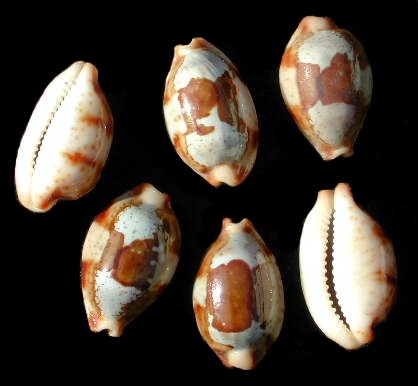 Talpa Shell belongs to the Cowry family of shells. 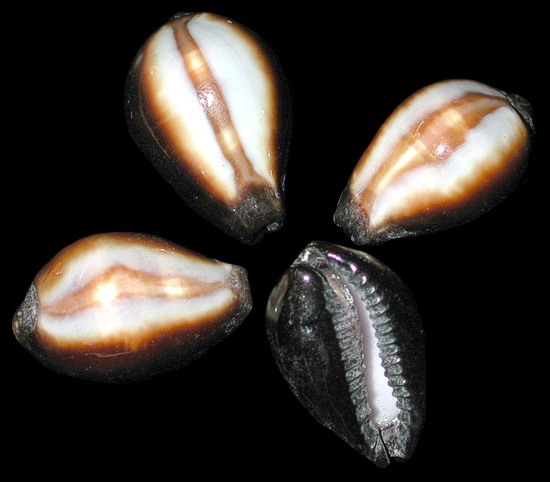 Other details of habitat is the same as the other cowry shells described earlier. Description. Gastropod belonging to the Cowry family of shells. Noted for its color and top shell markings. This shell is fairly rare. Habitat Like most other Cowry shells they are found in the Indo-Pacific region; ranging from the Eastern African Coast to the Northern Australian shores. The prefer coral reefs or rocky sea floors. 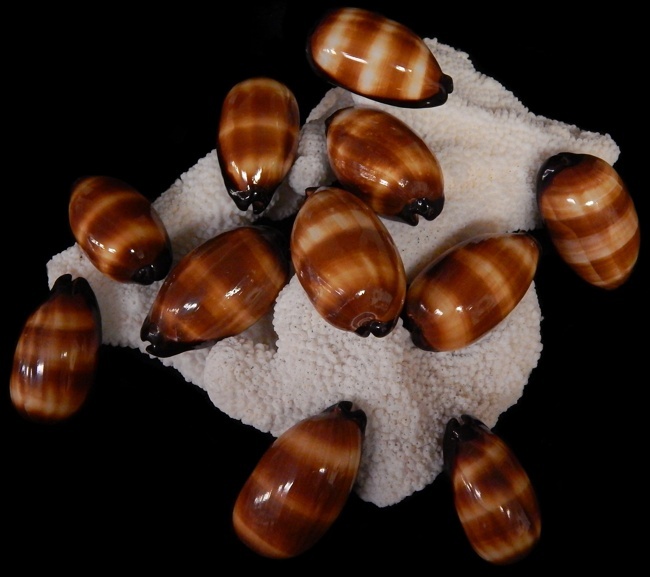 The Cyprea Teres like other Cowry shells are nocturnal (active at night) feeding on algae. 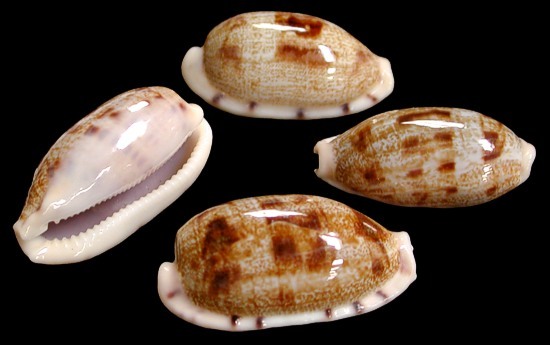 The Cyprea Argus belongs to the Cowry shell family. This shell is heavy for its size with a broadly cylindrical body whorl and a slight convex base. The Cyprea Argus color. Has four dark brown blotches on the under side laying on a light brown base. 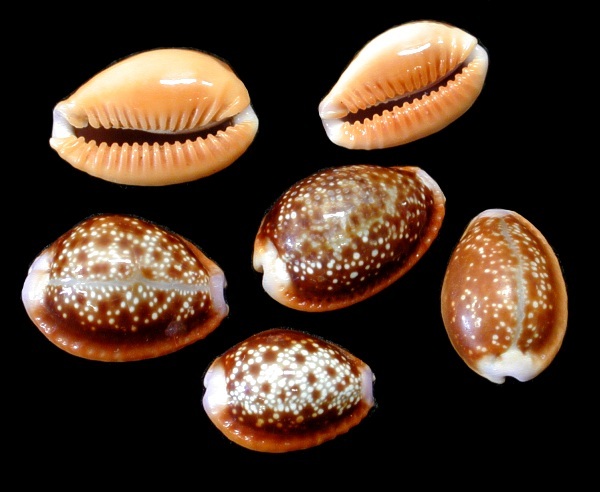 Pale brown bands are overlaid with brown cirles (hence its nick name Eyed Cowry). The cyprea Argus prefers coral reefs. They are mostly found across the Indo_Pacific region from the Indian Ocean east to the Northern shores of Australia/New Zealand. 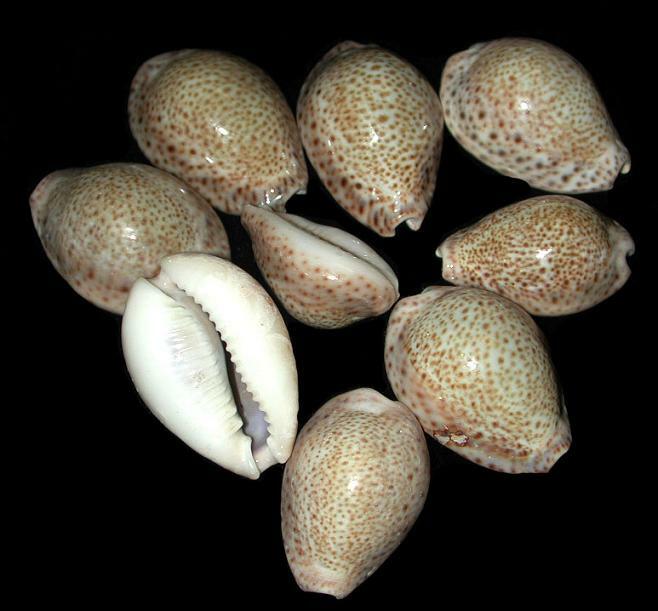 The Cyprea Cribraria belongs to the Cowry shell family. This shell is heavy for its size with a broadly cylindrical body whorl and a slight convex base. The under side of the shell reveal its teeth. They can be seen in the listing picture. The Cyprea Cribraria color. Top of shell has white spots with honey brown background and white or light cream on the under side of shell. The Cyprea Cribraria prefers coral reefs. They are mostly found across the Indo_Pacific region from the Indian Ocean east to the Northern shores of Australia/New Zealand. 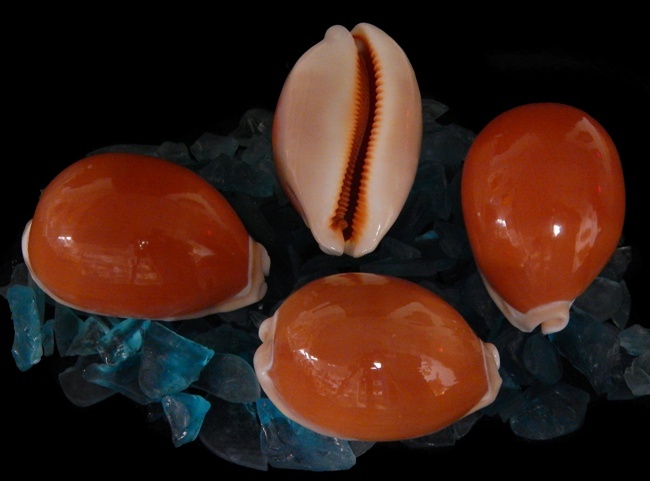 The Cyprea shell, Aurantium belongs to the Cowry shell family. It is a true collector shell found in the Indo-Pacific region. It likes to creep along the ocean bottom on the outer side of reefs. They grow to an average size of 3 inches. This is a highly coveted shell for collectors. These shells, until recently have been a rare find. The Cowry family of shells is a Gastropod (one shell animal). 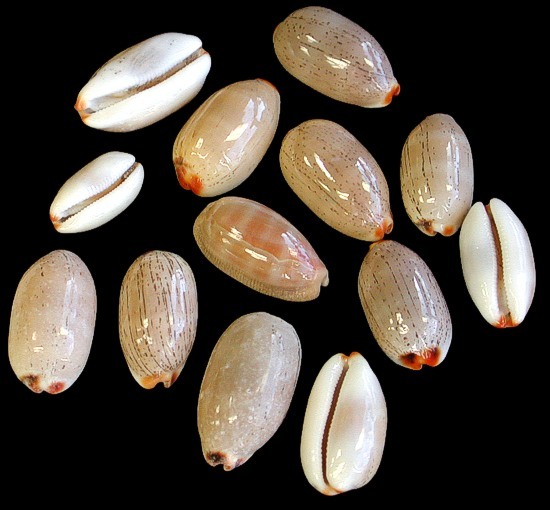 Cowry shells have a rounded top and flat bottom. 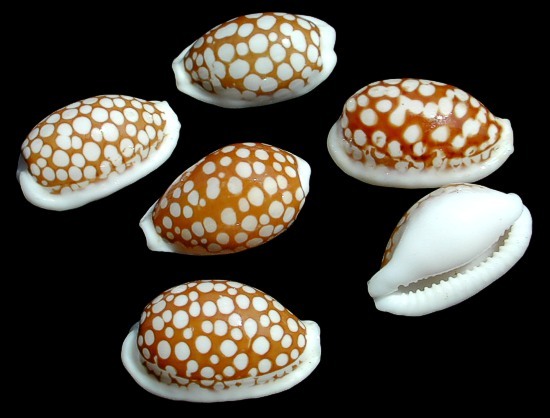 Cowry shells are a smooth shell with colorful markings. Many such as the Cypraea Aurantium have been used as jewelry. The listing picture. The picture perfectly shows the deep orange top shell with a creamy under belly. 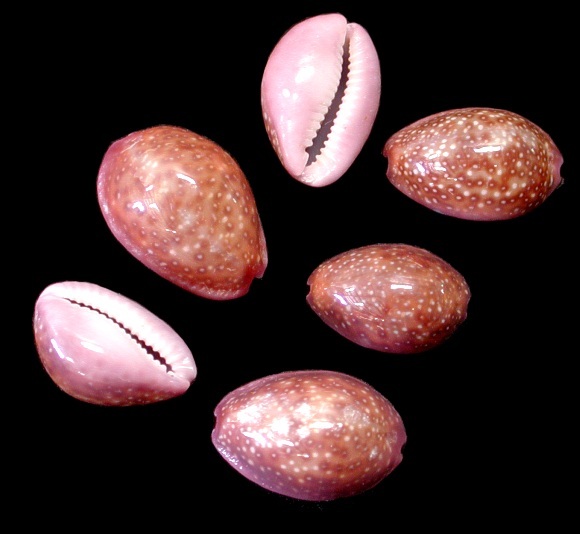 The under side of the shell is flat and classic Cowry. These Cypraea Aurantium have some stress lines but this is normal for the species. 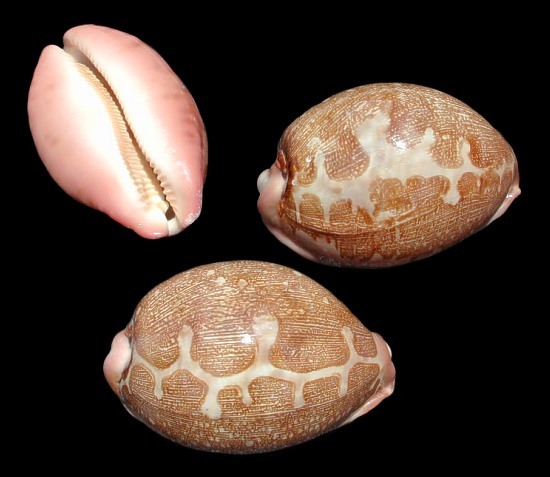 The Cyprea Mauritiana belongs to the Cowry shell family. It is often referred to as the Humpback Cowry. The Cyprea Mauritiana's color is cream, overlaid with dense brown. There are rounded often fused light colored spots. The margins, base and teeth are dark brown with lighter spaces between the teeth. The Cyprea shell, Mauritiana lives in the Indo-Pacific region which is from the Indian Ocean east to the North shores of Australia and New zealand. Shell type Gastropod. A Gastropod is a mollusk that produces a single shell. It belongs to the Cowry family of shells. Cyprea shell shape varies little but there is wide differences in the size, color and pattern. The Cyprea Testudinaria is popular for its unique pattern. Habitat This species is active at night, found in the Indo-Pacific region near coral reefs. They feed on algae. Description. The Caurica Cyprea Shell is a fairly common cowry, found in the Indo-Pacific Tropical region; primarily around the Indonesian Islands, near and around reefs. They are popular for craft use, tank decorating and with collectors. The shell is a mixture beige, tan and bands of cream. 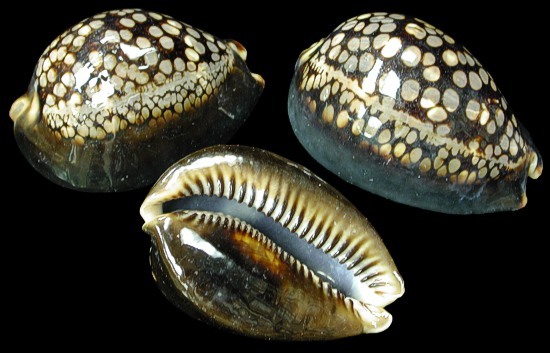 Like other cowry shells, this species prefers a nocturnal (active at night)life. Description. The Cyprea Onyx is a common Indo-Pacific shell. They, as other species of its kind are nite creatures; living near rocky or coral reef areas. 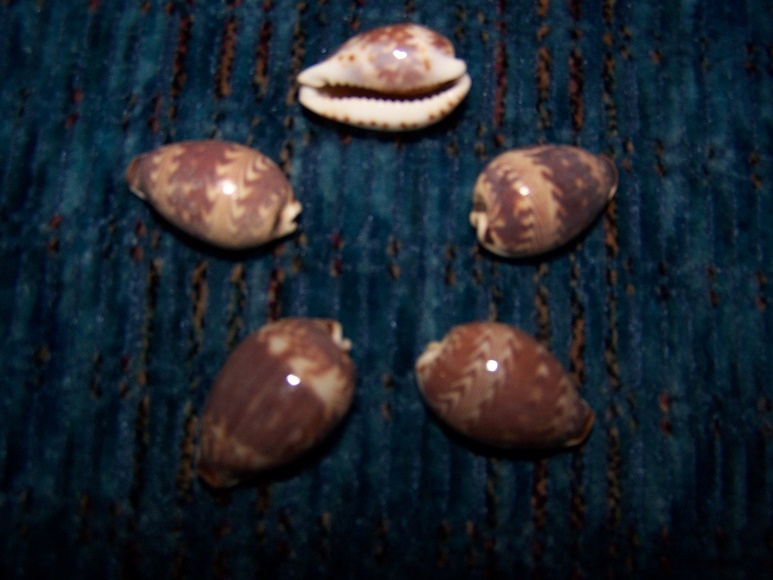 These are common cowries averaging 1/2 to 2 inches. The dorsum is yellow-ocher or pale brown, with many small white spots. The extremities of the shell show dark brown spots. A dark brown area which is roughly rectangular is present on each side close to the edge. The base is white to light beige, with thin transverse stripes. This species and its subspecies occur in the Indian Ocean along the coasts of Aldabra, Chagos, the Comores, the East Coast of South Africa, Kenya, Madagascar, the Mascarene Basin, Mauritius, Mozambique, Réunion, the Seychelles, Somalia and Tanzania, as well in the Western Pacific Ocean (Malaysia, Australia, Philippines, Polynesia and Hawaii). These cowries live in warm tropical waters, on shallow intertidal reefs or in lagoons at about 6 to 10 feet of depth. Like most other cowries, during the day they usually hide under rock slabs with the mantle drawn into the shell. They feed only at dawn or dusk. These are common shells averaging 1/2 to an inch in size. The shape is somewhat ovate, the basic color is brown or violet-chesnut, with two or more zones of several white dorsal zigzag-bands and distinctive dark spots on a white base. The extremities are edged with dark chesnut areas. This species is found throughout the Western Indian Ocean along Sri Lanka, Aldabra, Eritrea, Kenya, Madagascar, the Mascarene Basin, Mauritius, Mozambique, Réunion, the Seychelles, Somalia and Tanzania. This tropical cowry can be found in the sandy to muddy intertidal water shallows, under stones and blocks of dead coral.